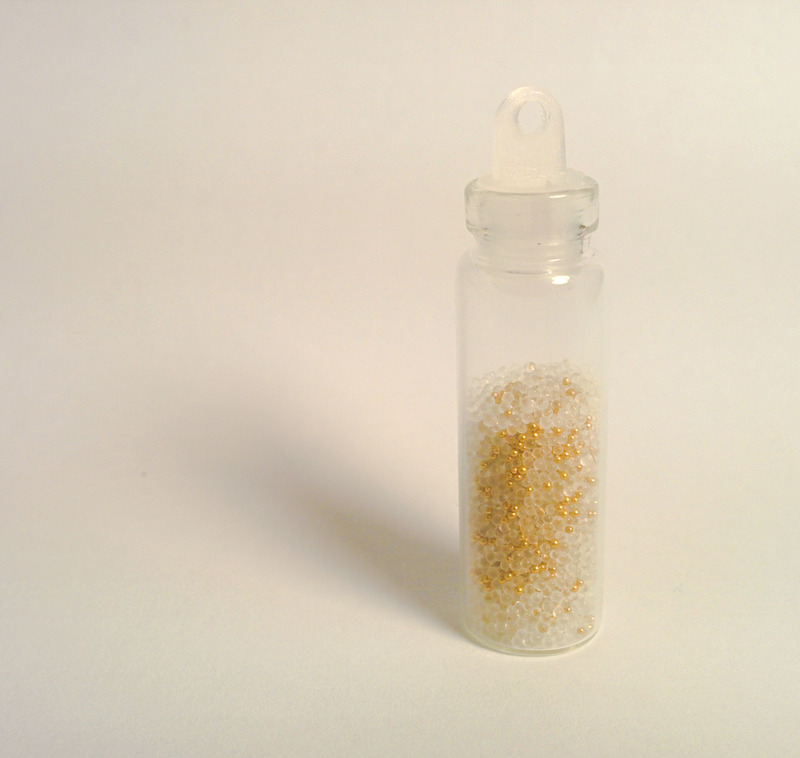 Tiny bottles in the mail! Yaaay! I bought these online to make some things out of. They are small and light, so will make great necklaces. 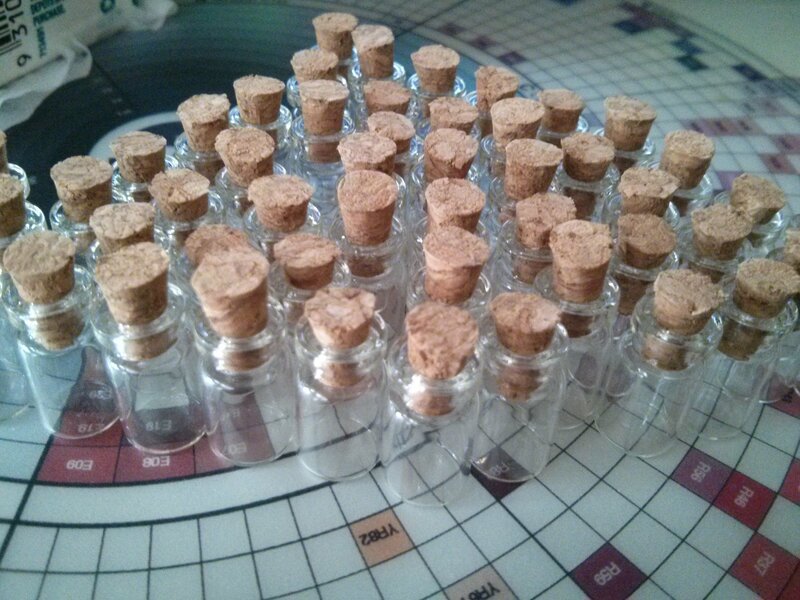 They came with little eye screws, so attaching them to things will be easier, as long as the corks are glued in well. Another package arrived with a 2mm mechanical pencil that I’ve wanted for ages. I hadn’t gotten around to buying it in the art shop, so I decided to get one online. It worked out cheaper, so that’s good. It’s smooth, dark and solid so will be great for drawing. It also came with twelve refill leads so I might never need more. No matter how much I draw, I hardly ever use up pencils, as I have so many, they each share the load, evening it out. While watching drawing videos, this week, I saw someone lining their drawings with coloured ink and a brush, which urged me to try the same. The only coloured ink I could find was some old calligraphy ink in red and turquoise, which had come in a magazine set. As it turns out, these inks were water soluble, meaning they reactivate and bleed when water comes into contact with it. This was a small issue, as I wanted to use watercolours on the pictures, but I used this to my advantage, incorporating the blue into my design of the mermaid above. I wanted to draw a mermaid at some point this month, as in the drawing community online, May is known as Mermaid, and is the time to draw them. I’m not crazy enough to draw one every day in the month, like many others do, so one is enough for now. Perhaps I’ll put some waterproof coloured ink on my list of things to buy one day. 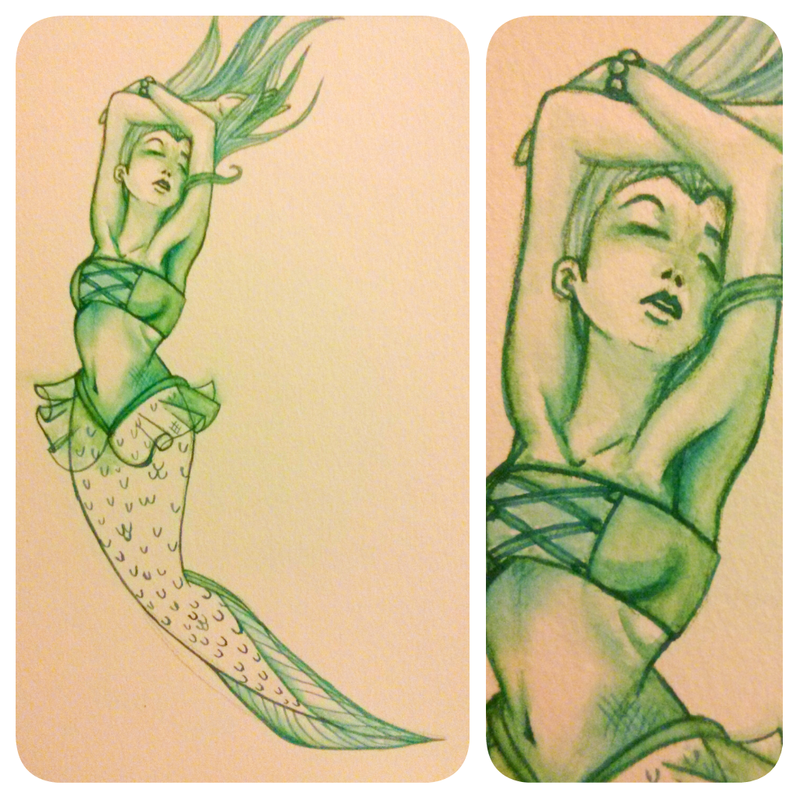 My mermaid isn’t quite finished yet, and the photos are more green than the piece is, but I like it so far. 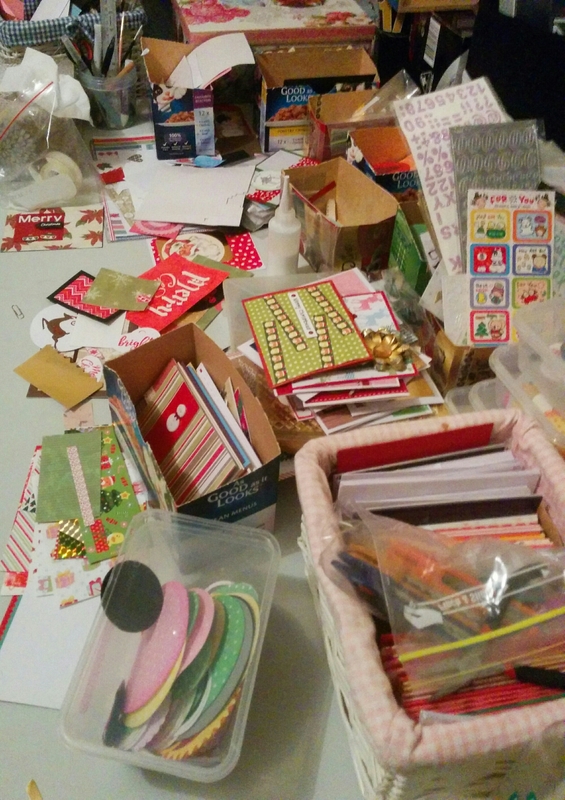 Christmas cards are full steam ahead, with plenty of supplies and crafting stations set up and ready. To be honest, I probably had enough left overs from last year to make this year’s cards, but I have gotten quite a few more supplies that I’m excited to be using this year. I’ve been die cutting frantically, inking profusely and glittering everything and everyone that crosses my path. This has been a good time as I’ve been in the mood to be making a bunch of cards. Hopefully I can start finishing them, and not have a box of just started cards like I do now from last year. I’m feeling a very traditional, red, green and gold vibe this year, though there have been a few exceptions. Also, reindeer, gingerbread men and Christmas trees are taking a forefront in the focal department, as there have been a rise in supplies featuring them. Before this blog post sound anymore like a news report, I’m going to take my leave. Back to you in the newsroom. More Overwatch fanart. I had my sketchbook out and ready, and a pencil in my hand, and didn’t know what to draw, so I asked my partner what to draw. He immediately came out with “D.VA from Overwatch!” So, I drew her that night, and spent the next day lazily colouring it in. 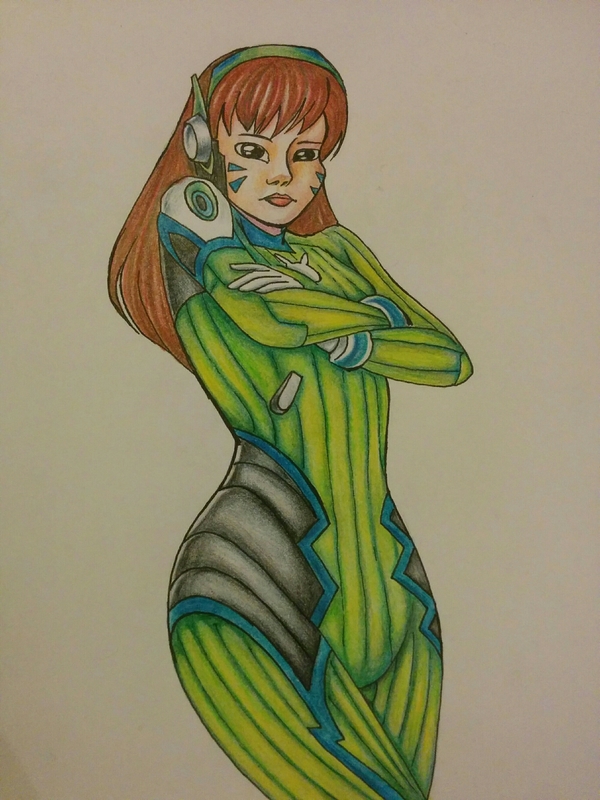 Her suit is normally purple, but my partner always tries to get the green coloured skins for all the characters, so I drew her in a green suit. This rather annoyed me, as there is so many different types of artists, and it isn’t something that is defined so easily. I’m not sure I could outline what makes people artists, as it’s often a title chosen by the person when they decide they deserve it. I contribute a lot to my art, and practice everyday, I come on here, and try to teach art and craft online. I occasionally make webcomics and fanart. In my eyes this makes me an artist. Just because I haven’t sold any pieces, or paint canvases for galleries doesn’t take that away. I know the person didn’t mean to annoy me, and I shouldn’t let it get to me, as I am firm in my belief that I’m an artist. But I just wanted to share it with you, incase you get a similar comment. 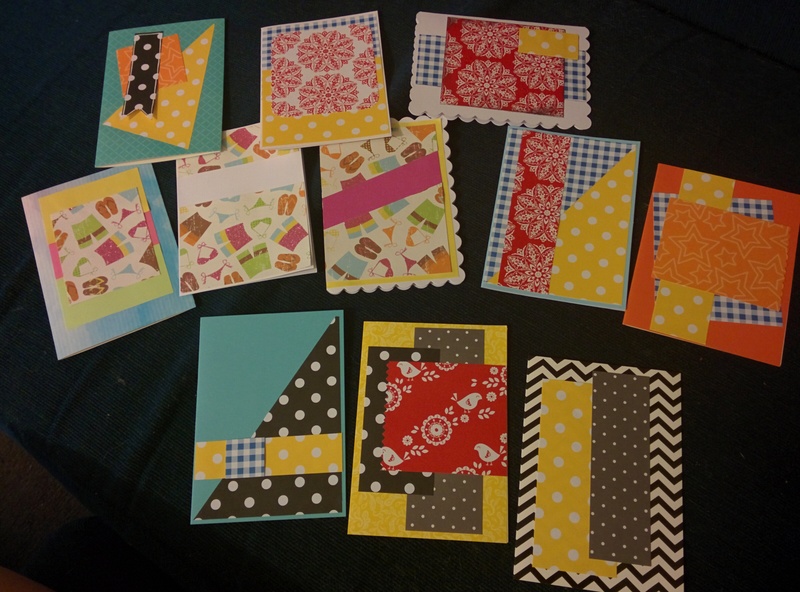 Decided to take a different approach to card making, and used a guide to cut the scrapbooking paper into many little bits of paper. Not many are Christmassy colours, but that way if they aren’t used at Christmas cards, they can be bases for any occasion. Besides, Christmas cards don’t strictly have to be a certain colour. There’s enough tinsel around to let you feel Christmassy. If you need a red and green card, after scouring the shops for gifts and listening to carols all day, to remind you that it’s Christmas, then you need some medical attention. I won’t even get into the debate between Merry Christmas and Happy Christmas. Too hot. Looking at snowflakes isn’t helping. Found this piece heat embossed ready to watercolour while I was cleaning, so I did that afterwards. 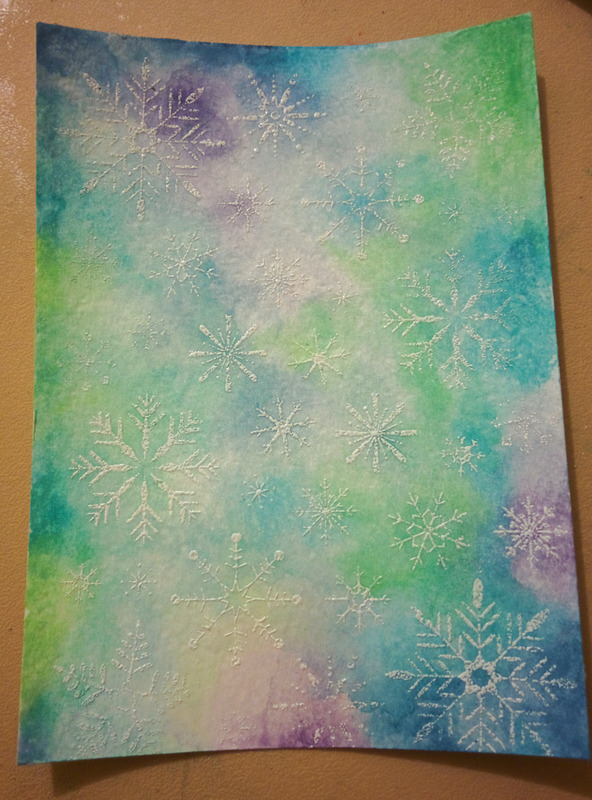 The powder was very spotty, so some snowflakes are hare to make out. I may go over these with my white Uniball Signo Broad pen. I have also been making a bunch of paper boxes. It takes much less thinking power to make than cards, so if I don’t get all the cards done, I might fill the boxes with chocolates to give out. Provided the chocolates or my brain doesn’t melt till then. Trialing some macro photography with a crude home made light box. I wanted to photo some objects to make a background at raspberrysheep.com. It still needs some tweaking and isn’t good for your eyes at 3am, but it’s a start. I just looked at it on my phone, and noticed it has a yellow halo on some pictures that didn’t appear on my laptop. One of the issues of web design is optimising for as many devices and browsers as you can. Hopefully, I can make a better and bigger light box to photograph my crafts. The one I made is a semi clear storage box on its side, with foil taped on either side with a lamp, resting on a tissue box aimed overhead, or in front, depending. It wasn’t even large enough to fit a card in nicely, so I’ll have to make it bigger. Maybe I’ll use a bigger box. There are plenty of instructions online to make light boxes for photography, and I even bought white tissue paper for it, I just got lazy, but it probably worked out just the same. In the mean time, I’ve been finding small things to photo, like sequins, pens, bottles, and rhinestones. I’m trying to stick to aqua and pink to go with the raspberrysheep theme, but I’m also practicing changing the colours using Photoshop. I certainly need a lot more practice on that. I also started on some custom social media buttons for the site, so we’ll see how that goes. This weekend, I needed a break from staring at Christmas paper for the cards, so I did a bit of colouring and needed a birthday card. Luckily, I had a card that I was trying to make, but wasn’t very Christmassy, and worked much better as a birthday card. I was struggling between using gold or silver to accent the card, as I liked them both, but the silver won out. As for the colouring, I used my Staedtler triplus fineliner set, and used a variety of hatching, stippling and lines to fill in areas. This was more about doodling casually and not worrying about cards and things and whatnot. 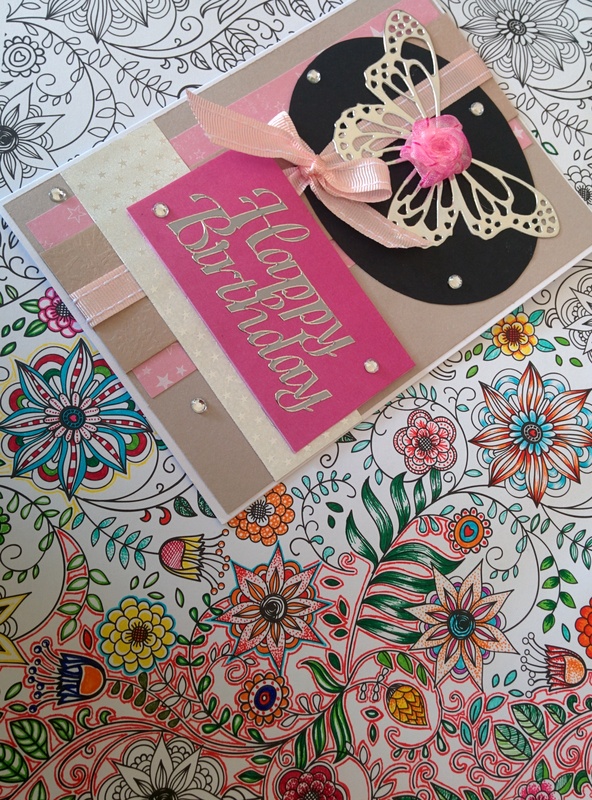 Spose I’d better get back to my pile of card making. It’s a heart.. No really. Well it started as one. It was only a test, so I wasn’t trying hard to keep the shape. 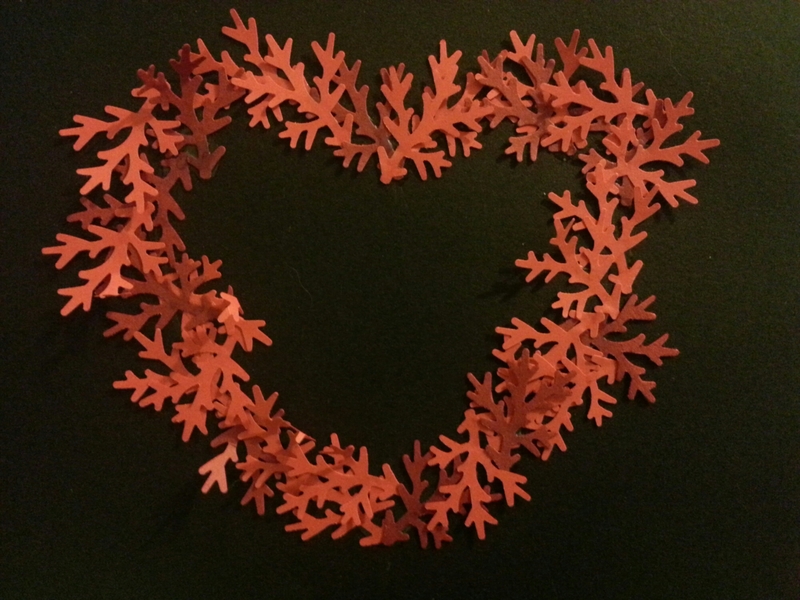 I only used the branch punch and two colours of paper. By only gluing the stem down, it left bits to stick out and looks nicer. It think it looks rather autumny, which is fitting. It will be fun to find colour combinations that look realistic or maybe make a full size wreath with heaps of layers.